Content: It’s long and slow and while the romance is fairly age-appropriate, it’s not just alluded to. It’s in the middle grade (grades 3-5) section of the bookstore, but I’d gear it to the older end of the age range/young YA. Kymera is a newly formed creation of her Father’s.She’s part girl, yes, but also part bird and part.. something else with a scaled, stinging tail. Her purpose, her father tells her, is to rescue the girls that have been imprisoned by the wizard. She heads into Bryre every night, stinging the guards and bringing out one girl which her father then tells her is being taken to the safety of Belladoma, a nearby country. If you’re not getting huge creeper undertone vibes from this, I’m really not doing it justice. See: everything is not what it seems. One of the best things about the first half of this book is the unease that Connolly writes into it. I just KNEW something wasn’t right, that Kymera was being too trusting (then again, being new-born she didn’t know any better), that something would go horribly wrong. And, once she meets a boy, Ren, against her father’s wishes, it does. I won’t tell you how it all unravels; the twists and turns are best left to surprise. So, even though this is a slow book, with a lot of internal dialogue and musings, I was still interested enough to keep reading. I loved the dark Frankenstein-like aura it has, though it has a very Grimm-like overlay. Like Connolly couldn’t decide whether to tell a fairy tale or a monster story. But, the mashup works. See, it turns fairy tale in the end, and I think we were supposed to be Moved by the ending, but I felt cheated. 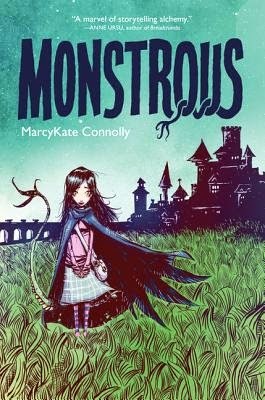 I suppose I wanted some sort of middle-grade happily ever after, and I should be happy Connolly refused to give it to us, but it felt… forced. And that made me dissatisfied. But, overall, it was a well-done, dark middle grade fantasy.